Fall, to me, is the start of baking season. My daughter and I usually bake a lot come August when she's tired of going to the pool, and it's too hot to be outside. Now, with the kids back to school, bananas are getting old quick. 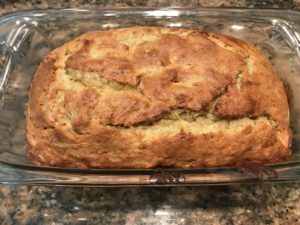 Upcycle those brown 'naners and make some yummy bread! Either with a stand mixer, or hand held mixer, blend butter and sugar until smooth. Add bananas and blend until combined. Add eggs. Blend for 30 seconds. Add flour, cinnamon, nutmeg and salt and stir to incorporate. Pour into greased loaf pan and bake, in center of oven for 55 minutes, or until a toothpick inserted in the middle comes out clean. Do You Hide The News From Your Kids?